On Saturday, December 18th, 2010, a larger than usual number of Israeli and international activists joined Beit Ommar villagers in their demonstration against the continuing encroachment of Karmei Tsur settlers on land belonging to local farmers. Approximately 80 people took part in the high-spirited demonstration, which was accompanied by a group of Israeli drummers. 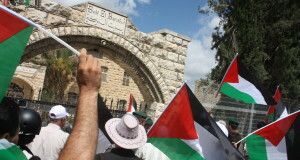 Demonstrators also waved the flags of the various countries that have recognized Palestine’s right to self-determination in the last few weeks. 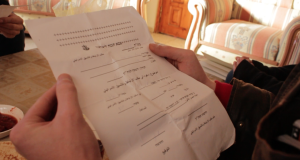 As the demonstration was starting, a group of ten Israeli soldiers occupied the house of a local family at the southern edge of the village. The terrified family of five was forced into a separate room while the soldiers used their house as a vantage point from which to observe the demonstrators. The soldiers remained in the residence for a total of three hours. 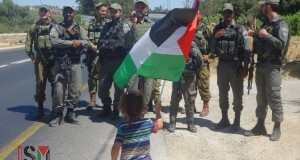 As the protesters approached the fence around the settlement of Karmei Tsur, they were confronted by an additional group of Israeli soldiers and border police. Soldiers repressed the unarmed demonstration with tear gas and stun bomb. One soldier injured themselves while trying to throw a sound bomb. Several high-velocity tear gas canisters, deemed illegal by the Israeli military’s own protocol, were fired at the heads of the demonstrators. One Italian international and one Israeli solidarity activist were arrested by Israeli Forces.